Acquiring data from a variety of sources, and transferring it to a variety of standards and hardware. Versatility means resilience, cost-effectiveness and flexibility. An environmental monitoring system flexible both in acquisition and transmission will always outperform a system relying on a single supplier. I.e. when data is acquired by a proprietary sensor, transmitted to a proprietary logger and in turn to a proprietary modem. Manual water monitoring solutions (manual observation, visual inspection) are operationally expensive and generally challenging to adapt to actual operational needs. In cases where water monitoring requires analysis of parameters where sensors aren’t available (e.g., metals, OC/OP). Or in some rare cases where water monitoring remains prohibitively expensive (e.g, NOX), manual sampling may be unavoidable. Hardware must be platform agnostic. Sensors, modems and data-loggers that lock a user into only transmitting data to a proprietary platform will lock-in to the one vendor. Lock-in to a vendor will result in extraction of unreasonable fees. It may also prohibit the selection of the optimal hardware for the right site. Watch out for lock-in by checking if the data transmission format is only available in the vendor's proprietary format. Favour instead options where an open source (e.g., .csv) is supported. Look for constraints on modem and logger settings on the selection of end-points. Versatility, flexibility and resilience are essential to your holistic water monitoring approach. It is the primary reason why we based our technology on IoT, hardware-agnostic standards. We are also proud to contribute to the adoption of environmental IoT standards. Generating information from data: Deployment of a medium-sized environmental sensor data network can yield massive amounts of data. This data, pregnant with meaning and insight may only be accessible after extensive data analysis, dicing, splicing and visualisation configuration. 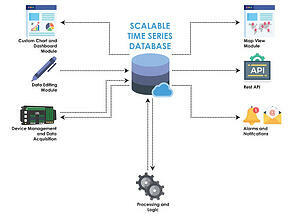 Depending on the project, end users will need to analyse data over different time-scales. Using different tolerance levels, setting up different alerts for different stakeholders. Some will focus more on trending historical data, some will only look at real-time data exceedances. Others will look to gain insights to cause and effect by statistical analysis and data mining of large historical data sets. The data needs to be stored in a cloud platform that makes it available and easily customizable. So, how do I choose the right cloud sensor data platform? Keep in mind these key criteria when assembling water monitoring solutions. Can the system be managed in-house after the initial set-up? If the platform requires the engagement of a third party to make changes or additions, this will greatly increase operational expenses. Think about your potential need to add/change charts, users, settings, privileges, changing alerts, adding new sites. How easy is it to edit your data? What happens when you know that sensor data that has been transmitted is erroneous? This can happen due to sensor damage, calibration drift, maintenance work on hardware. How do you edit unwanted spikes in environmental monitoring data, so it does not durably blur your insights? The platform where you store data should provide a simple way to edit and modify data; to visually identify edited data. Provide a method to preserve the raw data stream (critical for transparency for regulatory or compliance applications). Can you manage the platform in-house? Ease of use and configuration. It is all good on paper to have a solution that “works” technically, but if data configuration requires ongoing programming, total lifecycle cost balloons. Utilisation drops and generally monitoring levels too. Can I manage edge devices? A device-agnostic platform that provides some device management functionality for the main environmental dataloggers can streamline the operational management of a datalogger network. The Queensland (Australia) Department of Environment and Science reported that using software like eagle.io to manage their Campbell Scientific dataloggers saved the equivalent of 1 FTE. Is it built with Users in mind? High-performance is more than just clean and powerful software. Technology alone is not enough. Your software must be engaging and attractive to visualise results if you want higher uptake, usage and benefit. Users and subject matter experts MUST be able to set it up themselves. And so without the extra cost/delay/risk of relying on rare internal resources (programmers, developers). Using similar resources from an external 3rd party even more so. Is it sufficiently versatile for your business? Let’s imagine, you are the GM at a mining outpost. You must ensure proper monitoring of ground, surface water data and geotechnical data, across a dozen, massive tailing ponds. What happens if the environmental engineer at the mine breaks a leg during a site visit? Or just goes without warning to another employer? What if a water pump monitoring system goes down. Who knows their password? You find a replacement that you hope to upskill as soon as possible, but what happens when they go on leave? Or when he or she realises they do not know how to read that data configuration? Or how to use this feature? How do you annotate a specific data set or data event, so that another stakeholder can understand it immediately? Does your system allow for quick user creation and management? What if some of these users only need to visualise the data, and some need to edit the data? Do you have a simple, intuitive, easy user privileges management option? Is your system enjoyable to use, is it easy to learn, is there any support provided either online or in person? How long would it take on average, to set up a basic monitoring configuration and visualisation? A month? A week? A day? 90 seconds? These considerations are all essential to your modern, high-performing water monitoring. Your system must be easy to deploy, scale, use and train on. It should be bulletproof and easy to customise. It should finally be intuitive to use and configure. At high level, it should be easy, and user-friendly enough, to feed the right data from any source, to any device and any user at any time. Engineering cloud-based water monitoring system can seem like a costly and daunting task. But it makes perfect sense across the board, across technological, human, and financial aspects. Environmental monitoring programs including a cloud or IoT foundation will outperform, and gradually push into obsolescence, other standards. Long gone are the days of the need to travel to remote sites to measure gauging station flow. Or measure EC, pH, DO or turbidity using a hand-held multimeter. Water quality monitoring and sampling equipment are increasingly leveraged by high performing environmental IoT software. It’s no longer necessary to fly out over remote cattle stations to visually inspect the height of water in a cattle trough. IoT has revolutionised modern environmental monitoring through the supply of integrated sensors, loggers and modems. Tied to Cloud data platforms that turn data into information in real time - providing 24/7 remote monitoring capability. The industry is in a continued state of technological revolution. Early solutions relied on proprietary hardware, feeding narrow data into a proprietary, rudimentary software. This was a revolution at the time, compared to manual monitoring. However, these are fast-becoming clunky, costly, user-unfriendly, brittle and rigid solutions when contrasted with IoT based water monitoring systems. Environmental IoT is the future of quality, cost-effective, resilient, high performing, relevant, 24/7, intuitive water monitoring. Whether you are an integrator assembling a water monitoring solution for a client, or a compliance officer working for a regulatory agency. Whether you are monitoring dissolved oxygen at a fish farm, runoff from an agricultural field or industrial discharge. Turbidity sensors, Ph, suspended solids, you can view the results over IoT for an overwhelming majority of water parameters. A crucial decision to make when deploying your network is choosing the right data platform. Your business will benefit from value realised and costs saved if you choose a platform built with users in mind. One that can be modified and managed in-house. One that works with all industry standard dataloggers, can process and transform data automatically, and manually (via data editing). Finally, your water quality monitoring systems should be holistic and include easy data configuration, as well as user management.